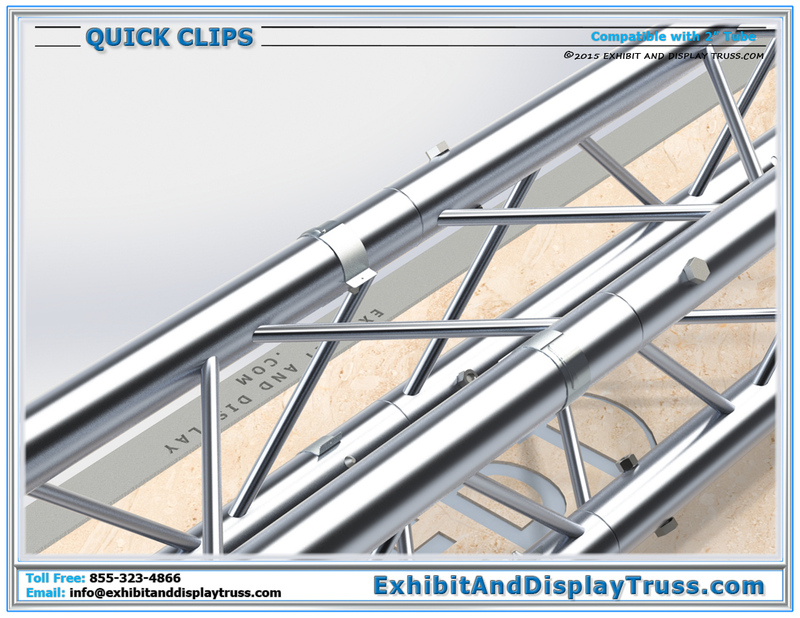 Quick clips are a great accessory to any small sized aluminum truss structure. Quick clips allow for a fast and easy set up and take down of a segmented unit. Our quick clips are used with standard inserts, but instead of using bolts on the exposed end for securing, the quick clips are easily snapped in place, eliminating the need for any tools. 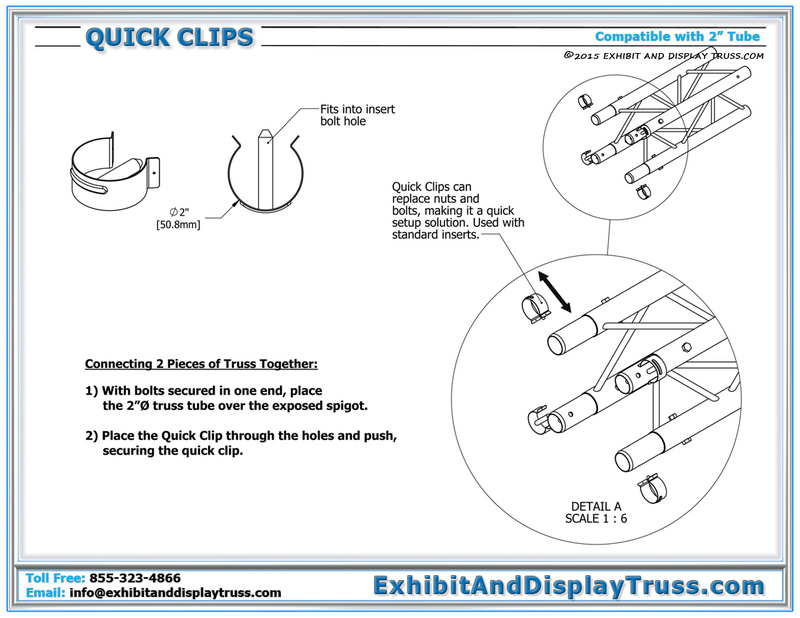 Quick Clips can be used with our 2″ tube truss. 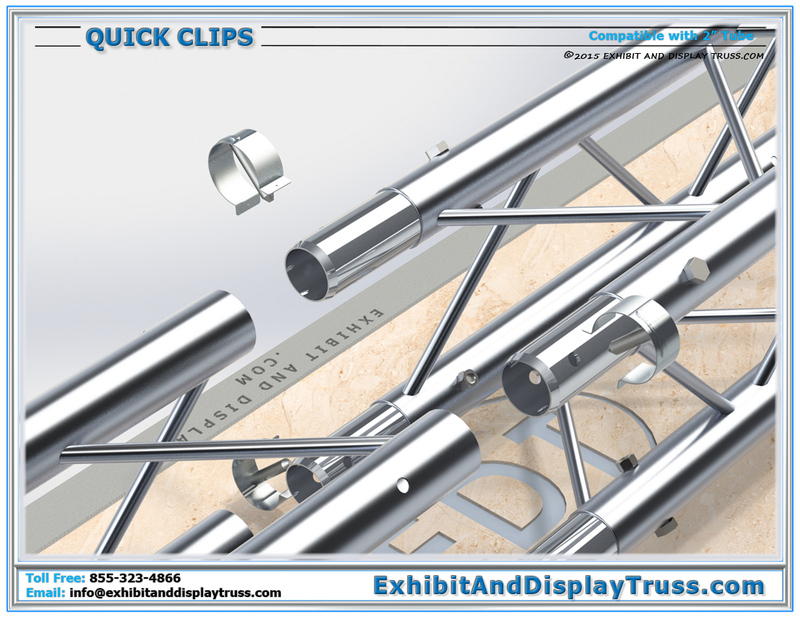 All of our aluminum trade show truss is designed for ease of assembly. Easily setup and take apart and transport your truss systems. Quick Clip Connection System. 2″ tube connection inserts come standard with each truss part, and quick clips can be used for one end of each connection insert. Aluminum Truss with 2″ tubes/chords can also be put together with quick clips, a faster method of truss assembly method requiring no tools. Truss components are constructed of square, triangular or flat pieces. Exhibit and Display Truss offers three different truss profiles, 10 inch, 12 inch and 6 inch display trusses. All of our truss structures are designed for ease of assembly and available in a number of designs and sizes. Our truss systems are constructed of durable, high-strength aluminum and steel for supporting LCD or plasma screen mounts, banner frames and sign frames, lighting truss displays and other marketing accessories and advertising. 2″ Chord Size (10″ wide and 12″ wide aluminum truss), is perfect for larger trade show portable trade show booths, offering more stability while still maintaining a lightweight and ease of transport.